New house, new + many more surfaces to clean. We had all but depleted our homemade cleaning stash while moving out of our old place. So, Stephen and I took some time to replenish our stores within the last week. Mixing everything together at once got me thinking I should share the mixes we use all in one handy post. I'd say we've been making our own cleaning supplies on and off for the last 4 years. Mostly on for the last 2, though we do get lazy about it on occasion. What keeps me using the natural stuff time and time again is its effectiveness paired with the cost savings. There are lots of recipes and mixes for green cleaners out there, but we choose to make the ones that require the fewest, most LIKE ingredients, if that makes sense. 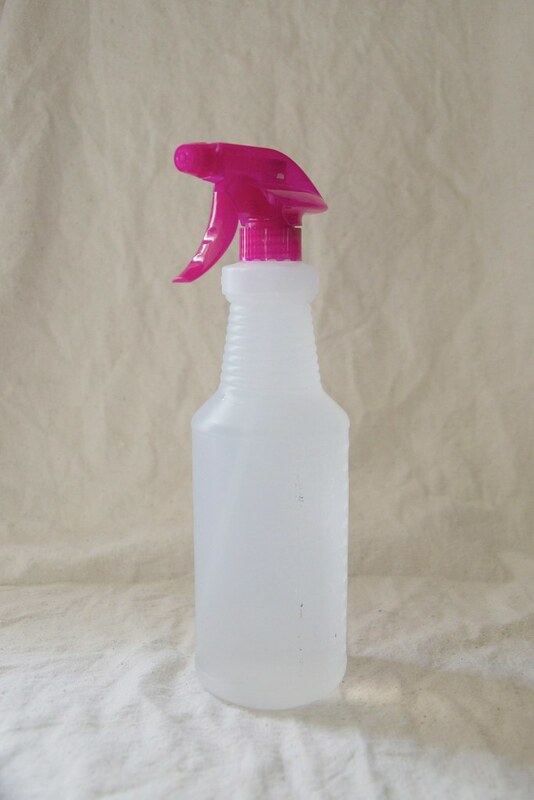 The first natural cleaner we made was an all-purpose spray cleaner. Now, I suppose I should also mention that we like to use a large stash of bar mops/rags for all our cleaning. We have a bin in our kitchen where we store the dirty rags and wash them once or twice a week. I'll get into some more specifics of our cleaning routine in another post. Borax: Also known as Sodium Borate is a naturally occurring mineral and shouldn't be confused with Boric Acid. It is highly alkaline and, as such, can cause mild skin irritation if you are sensitive. More info here. Washing Soda: Also goes by the name Sodium Carbonate. It's a known water softener. 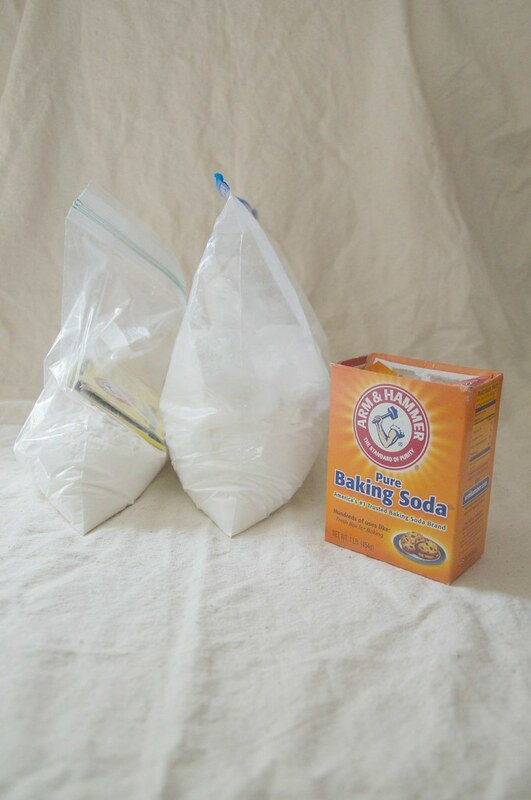 You can actually turn baking soda into washing soda by baking it at 400 degrees F.
Baking Soda: Also goes by the name Sodium Bicarbonate. It has a number of cleaning applications when combined with warm or cool water. It also helps lift delicious Chocolate Chip Cookies! Castile Soap: One of my favorite things EVER, castile soap has innumerable uses for the body and home. Basically it's just a natural, olive oil-based soap. You can learn more about it here, and our favorite kind is Dr. Bronner's brand. Essential Oils: Can be used in a wide variety of applications from cleaning to medicinal purposes for the whole family, etc. In cleaning they add a nice, fresh scent without chemicals. Beware if you own cats, though, essential oils can be harmful, so keep your cleaning supplies out of their paws. Combine all ingredients and store in a spray bottle. You can pick one up at your hardware store, use an old one that is emptied, or I've been eyeing these cool Full Circle bottles that include a tiny juicer for adding citrus cleaning power. Cool! To use: Spray liberally on most surfaces and clean with rags. 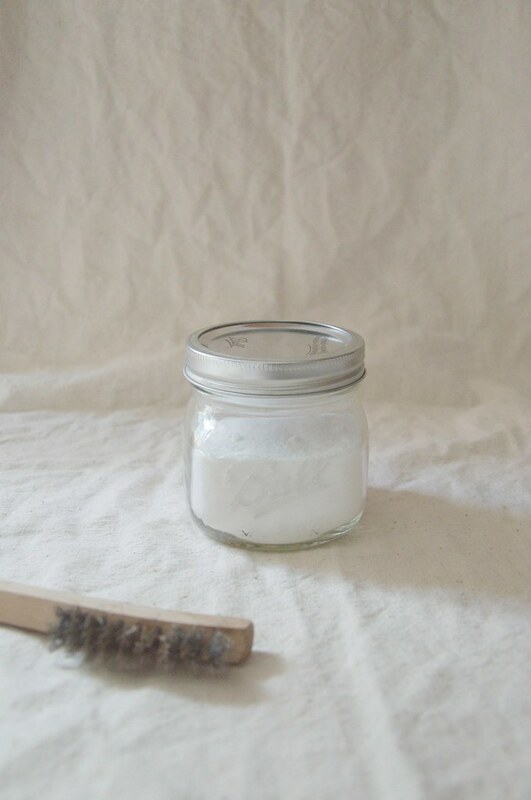 I use a similar mixture for windows and glass but add a few tablespoons of alcohol for a streak-free finish. I was skeptical, but it works like a charm. Combine ingredients in a bowl and transfer to a Ball jar or other container. 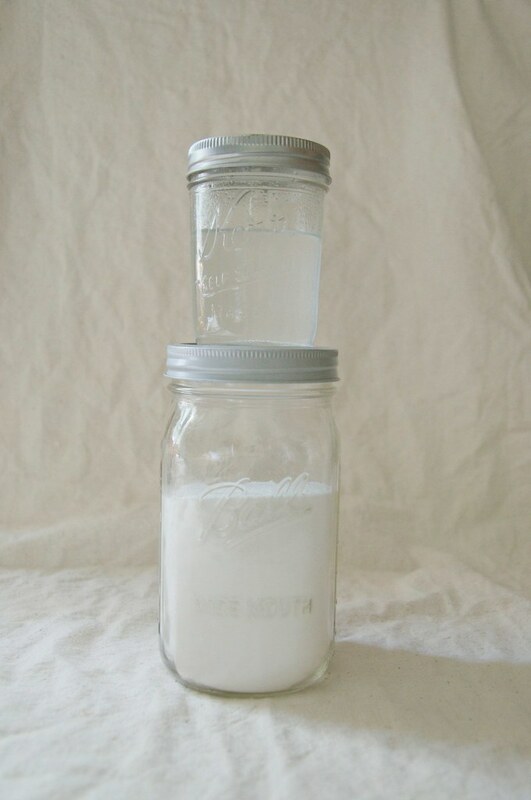 Use 1 to 2 tablespoons per load; fill rinse basin with the vinegar separately. I add some drops of essential oils to the vinegar for scent on occasion, which is why you see a separate container with the vinegar mix. Oh, and these days I'm digging eucalyptus and peppermint. If you find you're getting a residue after dishes have washed, you can consider adding some acidic ingredients to help -- we haven't had enough of an issue for it to matter. I don't have this one pictured because we inherited some dish soap from our previous owners, thus we didn't need to many a new batch yet. Anyway, I sometimes use just plain castile soap for dishes, but I have found if you water it down a bit it tends to wash away a bit more easily. I grew up in a Comet household and remember the burning and stinging of that chemical stuff -- this is much better! Combine ingredients and store in a jar. You'll want to wet whatever surface you're cleaning (tub, tile floor, sink, etc.) with water or even vinegar before sprinkling on and letting sit for a few minutes. Then use a bristle brush to scrub and rinse clean with more water. This one is right off the back of the borax box: Simply toss 1/4 cup borax in your toilet bowl and scrub around with a brush. Let sit for 30 minutes to overnight and then flush for a super clean toilet. In my next cleaning post, I'll tackle some laundry soap options and a few more specialized cleaners like wood spray and magic eraser alternatives. And in yet another post, I'll delve into the personal care DIY stuff we're doing these days. It goes beyond the No Shampoo Method, and we've been trying some new stuff that has worked . . . and other things that, well, haven't! 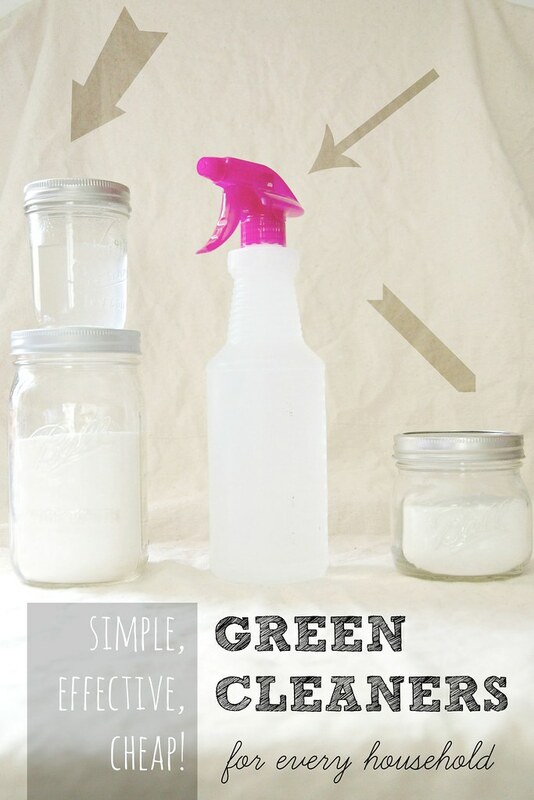 What's your favorite DIY green cleaner?